Price Drop! Was: $59.95 Now: $29.95. For a limited time only, while stocks last. Create endless streams of bubble magic with this easy to use and affordable Bubble Blower Machine. Simply fill the tray with bubble solution, turn it on and it automatically blows out bubbles with its dual blower revolving drum. Easy to use and operate with a metal mesh backing covering the fan to prevent curious fingers having little accidents. The Bubble Blower can also be propped up on its fold out leg to direct bubbles upwardly. Perfect for indoors and outdoor use. Ideal for parties, stage productions, wedding or any social event. Can be operated via 8 x AA batteries (batteries not included) for ultimate portability or you can use it via a power outlet (adaptor not included). 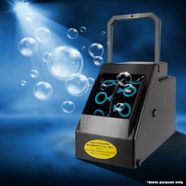 The Bubble Blower Machine has a plastic construction body making it light-weight and easy to move around. Safe and wholesome fun for the whole family! Dimensions (L x W x H) Package 25 cm x 12.5 cm x 17.5 cm approx.